I ran a comic store straight out of University. It was a great place to work because when you run a comic store, if you’re not reading everything you get in then you’re literally doing it wrong. Done right, as comics are a lot these days, they’re a medium based on a chain of enthusiasm. A publisher feeds off the enthusiasm of a creative team, gives them the tools they need to do the job and get the retailers enthused, who sell the book to their customers based on that enthusiasm. The books sell, everyone gets paid and we all go home happy. 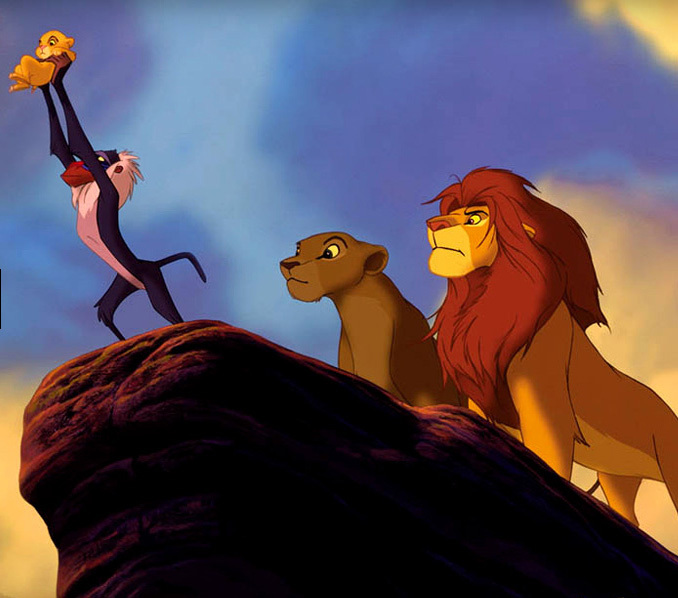 Right after that whole industry meeting with the Lion Cub thing. Every Retailer summit. Ever. Possibly with a few more lions than usual. The weird thing about being a retailer is that sometimes you have to divorce personal enthusiasm from professional enthusiasm. And by sometimes I mean, all days with a Y at the end. The simple truth is this; you can, and will, sell more of the books you love than the ones you don’t. I walked more copies of Transmetropolitan and Stormwatch out the door than my colleague who, in turn, walked way more manga out the door than me. But you also have to be enthusiastic about stuff you don’t normally like. Or at least be polite about it. So, if you’re smart, you’ll read everything you stock or, at the very least, learn enough to get by. Treat it like a language, learn the cultural landmarks, the basic phrases. It’s why I can order coffee in Spider-Man, even now. If you want to succeed, you make sure you know the ground, learn your business and prepare for the fact that you’ll be learning it forever. Like Admiral Kirk says, new minds, fresh ideas, non-big two publishers. That was the other thing about being a retailer in the late ’90s. Marvel were in the process of going bankrupt and DC were in the process of working out how to ensure Batman was in some form of hellish eternal crossover with every other title. It was, at times, pretty difficult to find books to get behind and, if you didn’t get behind books, you didn’t sell and after a while you didn’t have a job. So, I started digging in to the telephone sized directory of coming attractions, called Previews, retailers get sent every month. And that’s how I found Astronauts in Trouble. Published as it was then by AiT/Planetlar it was a mini-series dealing with a news crew something going very, very south on the moon. It was lovely, smart, burly action comics with a rock solid eye for character and based on two of my favorite fiction flavors; journalists and astronauts. I have loved control centers and press rooms since I first saw The Day The Earth Caught Fire. I cry every time at Apollo 13. I’ve owned Armageddon on two different formats and wanted to be Kenny from Press Gang when I was a kid. My commitment to Sparkle Motion? Not in doubt. So a comic about a news crew in a bad spot on the moon mashed every single one of my buttons. It helped that the thing was so much fun too. Larry Young’s sense of humor and sheer exuberance at what he was getting to do is on every page and it makes the book read like a really good action movie. Matt Smith (now Matthew Dow Smith whose work you really should be following) and Charlie Adlard turned in stunning art too. This is a clean lined but down at heel book that’s as crumpled and individualistic as the news crews it’s about. Because the sequel series was actually a prequel. It I wasn’t sold before, I would have been sold then. 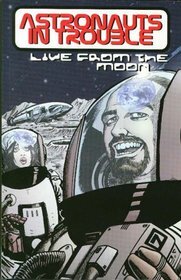 After that, a follow up, Live at Cool Ed’s, was released that was a series of short stories set at the first (and best) bar on the Moon. Together, they tell a trio of stories about the eccentric, heroic, occasionally deranged people that make history and the curious prices they pay for it. I read each one multiple times. I loved them. I think I even had a letter published in one. Even now, four house moves and one overseas stint down the line, the trades are still on my shelves. 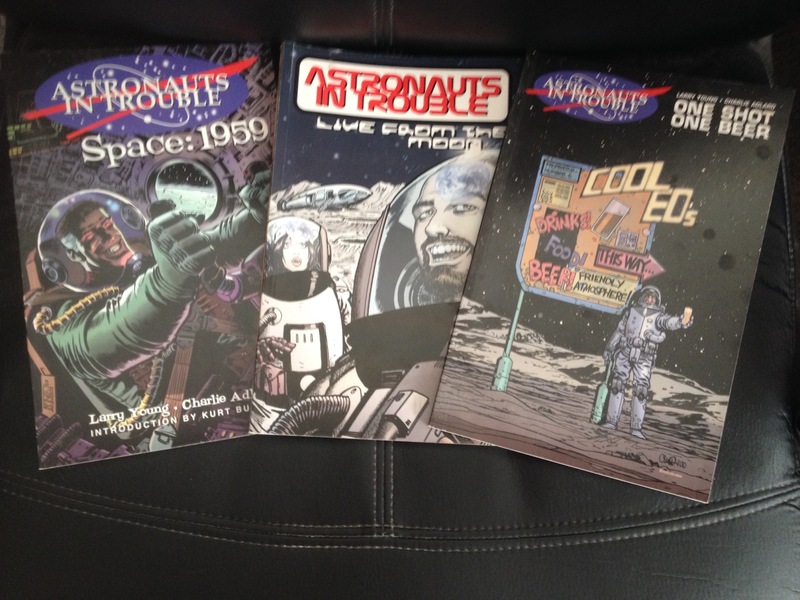 Not pictured: the scriptbook and limited edition Live at Cool Ed’s edition with the robot kit. I am, you may be able to tell, a fan. And now they’re back. Charlie Adlard’s work is massive thanks to his career-defining run on The Walking Dead and now, Image are putting what seems to be the entire series out in chronological rather than release order. So, we kick off with the 1959 news crew uncovering the beginning of the biggest story of their careers and move forward from there. It’s a great idea and a a great story; inventive, sweet-natured and energetic with a rock solid emotional core and some great art. Channel Seven is back on the air and trust me, this is a show you’re going to want to watch. I will be. Click here for the first issue on Comixology. Click here to find your friendly neighbourhood comic store.